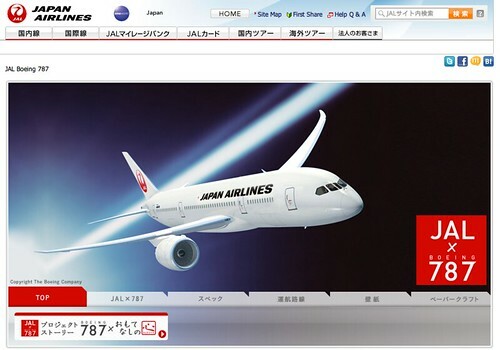 oneworld member Japan Airlines is pretty excited about their new Boeing 787 Dreamliner, so much so that they’ve even got a special website (in Japanese) to show off the new plane (hat tip to Pak’s JAL Blog). American Airlines continues to open more doors to Asia. Working with fellow oneworld member Japan Airlines, we will launch nonstop service between Boston and Tokyo Narita on April 22 on a brand new Boeing 787 Dreamliner. Boasting advanced technology and an innovative cabin environment with larger windows and new lighting features, the 787 Dreamliner provides a peaceful and comfortable environment across the Pacific. And to celebrate the occasion, American is offering a big fare sale, Double AAdvantage Miles and bonus Business ExtrAA points. Fly the brand new Boeing 787 Dreamliner to Tokyo! EXPERIENCE THE LUXURY OF THE 787 DREAMLINER. DATES: Travel between April 22, 2012 and June 30, 2012. OFFER: In celebration of the new nonstop service on Japan Airlines between Boston and Tokyo Narita, earn double miles every time you fly the route on a new Boeing 787. This offer is valid for travel on purchased, published Business Class and select Economy Class fares from April 22, 2012 through June 30, 2012. To celebrate the new service, we want to reward you with unlimited double Business ExtrAA points for travel on the American Airlines marketed (AA) flight operated by Japan Airlines between April 22 and June 30, 2012. Register your company for this offer by June 30, 2012, using promotion code BOSNRTDBL. AAdvantage double mile offer is valid on Japan Airlines operated nonstop flights for travel between Boston (BOS) and Tokyo (NRT) from April 22, 2012, through June 30, 2012. Includes travel on codeshare flights marketed by American Airlines and operated by Japan Airlines (booked under the AA flight number). Economy Class fares booked in Y, W, B, E, H, K, M, L, V or S on Japan Airlines operated flights. A round-trip from Boston to Narita will earn 13,402 base miles, so with the double offer you’ll earn 26,804 AAdvantage miles, which is enough for a round-trip domestic award. Registration is required before you travel. Go here to sign up for Double AAdvantage Miles offer using registration code BOSTY. To sign up for the Double Business ExtrAA points, go here and use registration code BOSNRTDBL. Hi Michael – I couldn’t find anything lower than about $4,600 round-trip on the 787. Premium economy was $3,300, which surprised me. I expected it to be around $2,300, which is just a little over half the cost of Business and about twice the price of economy. Oh well, it’s not like fare pricing makes much sense anyway. 🙂 Thanks for the question. @ Dave – It’s a long flight; 13:40 to Tokyo, and 12:50 minutes coming back. That’s a long time, even in first class. I just booked a ticket with Japan Airlines. I told my travel agency my AAdvantage number but I can’t find the reservation on the American Airlines website. I know it is a codeshare flight, but do you know if we have to book under American airlines to qualify for this discount? Thanks. I was able to book a RT using coach outbound on AA (upgraded to business) and business return on the JAL 787, for under $1900 all-in. Had to hunt for it, though.